This is the super hot pepper that started it all. All the way from Assam, India it is the first hot pepper to break the 1 million scoville mark. Now a pepper has to reach 1 million SHU to even get on the top 10 hottest list. Some still think the Ghost Pepper is still the world’s hottest, but it is far from it. Ghost Chilli (also known as Bhut Jolokia or King's Chilli or Naga Chilli) is one of the hottest chillies in the world, and grows exclusively in the North East of India. Available as Raw chillies, Pickles, Ghost Chilli Powder, Dried chillies etc. Raw chillies are available in Multiples of Hundred in India and in multiples of 1000 for International Buyers. This product grows only at Assam and on Seasons from May - September and December to February alone. We can supply of 50 Tons in the whole of season and on 365 Days from our Cold storages. As FIFO model, First in First Out basis the availability will be shared. 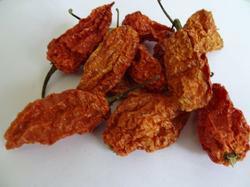 We have the best quality of Dried Bhut Jolokia / Ghost Chilli (Bhut Jolokia). The Dried Bhut Jolokia is thoroughly processed at our well-developed set up. Processed using the advanced method, our Dried Bhut Jolokia is free from impurities. The Dried Bhut Jolokia that we offer has long shelf life and is priced economically.